(Bloomberg) -- Want to receive this post in your inbox every day? Sign up for the Balance of Power newsletter, and follow Bloomberg Politics on Twitter and Facebook for more. Vladimir Putin’s efforts to rebuild a Russian sphere of influence where the Soviet Union once stood are in trouble. Yet with elections approaching in two ex-Soviet republics, corrupt and supposedly pro-Western elites are keeping him in the game. The desire to restore a Russian zone of control long predates Putin. His predecessor as president, Boris Yeltsin, thought it would take about 20 years for the 14 other states that emerged from the 1991 Soviet collapse to return to Moscow’s embrace, once Russia's economy revived. It hasn't worked out that way. 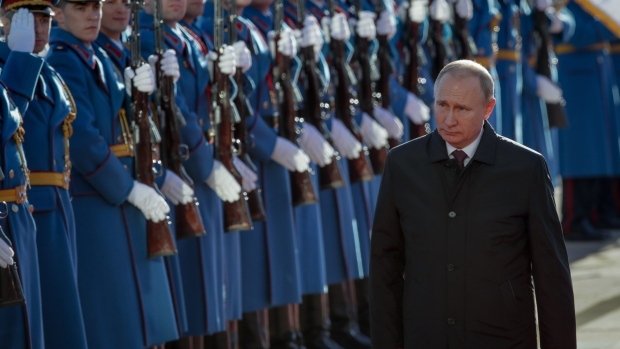 So far, just four ex-republics have joined Russia as members of the Eurasian Economic Union, the single market that came into existence in 2015 as Putin’s alternative to the European Union. The split with Ukraine after the 2014 pro-European revolution in Kiev was a huge setback for the most important relationship in the post-Soviet space. Even so, with elections due in Moldova on Feb. 24 and in Ukraine in March, the persistent influence of corrupt local elites ensures these countries remain in limbo, unable to integrate with the West even if they resist Putin’s embrace. Ready to rumble | With big delegations led by senior officials (Vice President Mike Pence, Politburo member Yang Jiechi), this year’s Munich Security Conference is shaping up to be a showdown between the U.S. and China amid tensions over Chinese telecom giant Huawei’s global reach. That’s even as trade frictions may ease, with U.S. President Donald Trump considering deferring his March 1 deadline for higher tariffs on Chinese imports by 60 days. Populist test | As forces align ahead of elections to the European Parliament in May, the widespread expectation is that populists will surge at the expense of the establishment. Even if true, that doesn't necessarily mean they'll be able to translate gains into political clout. Andre Tartar and Hayley Warren have churned the data to produce a graphic feast that asks whether populism might be peaking. Brexit turmoil | Theresa May faces yet another revolt from Brexiteers in her Conservative Party in a parliamentary vote tonight to give the prime minister more time to renegotiate the divorce from the EU. Though non-binding, a loss would effectively strip her of that mandate. The backdrop shifted dramatically after May’s chief negotiator was overheard explaining her strategy in a Brussels bar. Ian Wishart delves into Brexit’s city of spies. Question mark | Trump still hasn't committed to signing legislation to avert another government shutdown at midnight tomorrow. With Congress poised to vote on the spending measure, the president has signaled he'll probably accept the plan even though it falls far short of the funding he's demanded to build a Mexican border wall. Trump said the White House will look for “landmines” in the proposal before he makes a final decision. In hot water | Investor Tom Barrack, who came to prominence with vocal defenses of Trump, is drawing sharp rebukes for declaring it a mistake to judge Saudi Arabia for the murder of columnist Jamal Khashoggi. The president's longtime friend apologized, but the controversy has revived criticism of Trump for withholding judgment on whether Crown Prince Mohammed bin Salman ordered Khashoggi killed. Trump has instead emphasized the importance of the U.S.-Saudi alliance. Pence, Secretary of State Michael Pompeo and White House adviser Jared Kushner are in Poland today for talks on the Middle East and Iran. Also there is Israeli Prime Minister Benjamin Netanyahu, but senior European officials are absent. Click here to read about Netanyahu's gaffe on Iran. Putin holds talks today on Syria with Turkish leader Recep Tayyip Erdogan and Iranian counterpart Hassan Rouhani in Russia's Sochi, amid tensions between Moscow and Ankara over control of a key Syrian region once the U.S. withdraws its forces. Alan Crawford reports how the various summits show the disruptive effect of Trump's foreign policy. And finally....After progressively tightening his grip on China, Xi Jinping now reigns supreme in mobile apps. “Study Powerful Country,” a guide to the ins and outs of his ruling doctrine, tops Apple’s domestic download charts. The app contains a trove of news articles, video clips and documentaries about “Xi Jinping Thought.” Another app by Tencent in 2017 awarded points to the fastest applauders during a streamed speech by Xi, and similarly went viral. --With assistance from Rosalind Mathieson, Kathleen Hunter, Stuart Biggs and Alan Crawford.